We are obsessed with Dollar Store Craft's blog and how they always make the cutest and more elegant things with such inexpensive supplies. 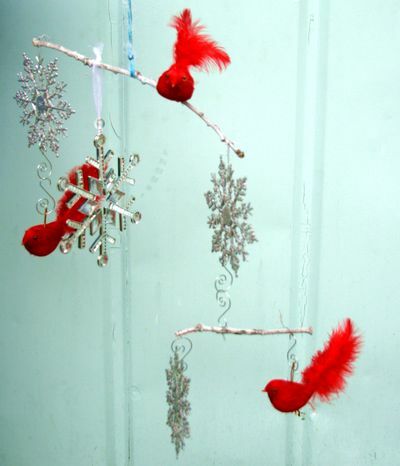 Here is a great Winter Mobile for your home! Be sure to give their blog a read! 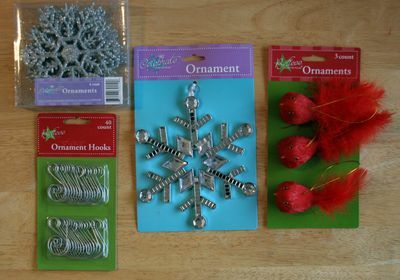 The dollar store has so many cute ornaments this year. 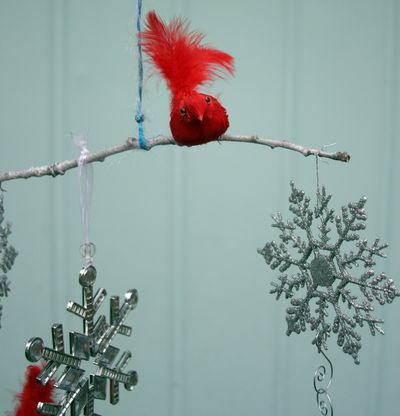 I picked up some shiny snowflakes and pretty red birds at the store, found some branches outside, and strung them together for a wintry mobile. You can use pretty much anything on your mobile, so pick your favorite things, attach them to a string and start making one! I used oak branches from my yard because I have a ton of them. 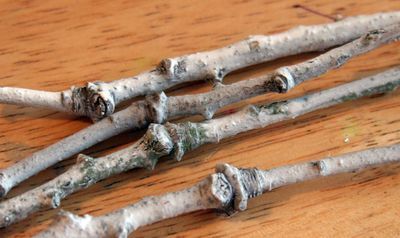 I spray-painted them with a light coat of white to make them look sort of like birch branches (more wintry!). My oak branches were pretty straight, but they have pretty big knots on them which hurts the balancing process (because the knots kept me from putting things precisely where I wanted to -- strings would slide off a knot). Choosing the smoothest sticks you can find is a good idea! Balancing the mobile is sort of a process of trial and error, but it's all about balance. 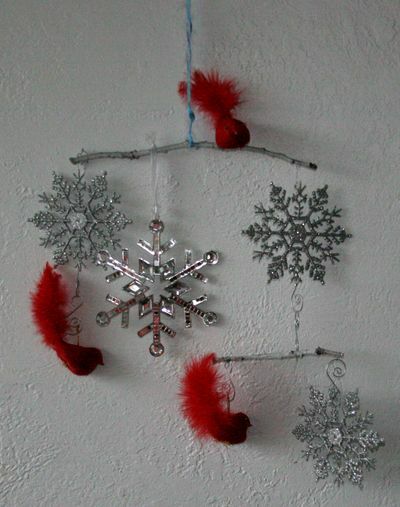 The easiest route is to make sure the mobile has equal items on each side and hang them symmetrically. 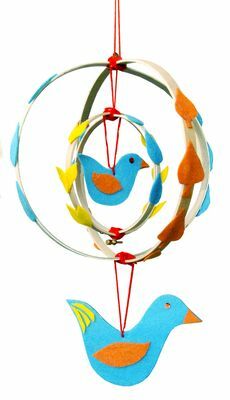 You will get the quickest results by planning a symmetrical mobile. I like to think of my mobile like one of those big doctor's scales that has the heavy weights that you move from slot to slot to adjust until you get the bar to balance just perfectly. You will have to do a lot of slight adjustments to get your mobile to balance correctly. I also like to think of my mobile like a teeter-totter (or seesaw): You know how they have three slots at the fulcrum so you can adjust them to compensate if one rider is heavier than the other? You can do that with your mobile by adjusting where the center attachment is located on your stick. Slide it closer to heavier items to help tip the balance in favor of lighter items. You can also slide items closer to the end of the stick to help them act heavier (or closer to the center of the stick to help them act lighter). 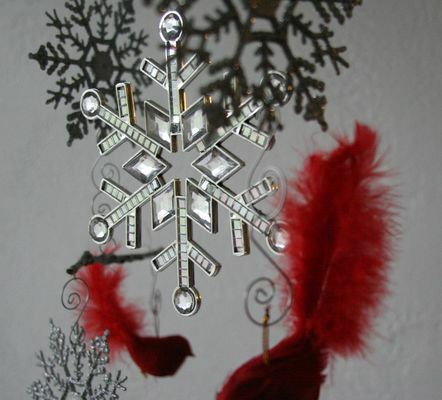 It helps to have an ornament near the center of a stick (see my rhinestone snowflake) because you can move it to adjust the weight distribution. Use a piece of wire to attach your components to the sticks because they won't slide around very much, making it easier to adjust the balance. Items should float freely and not bump into each other. Expect to have a lot of trial and error when building your mobile!